Enjoy Peak Performance in every aspect of your life! Successful athletes, business entrepreneurs and artists all have two characteristics in common � the ability to set realistic goals and the motivation to develop the skills and strategies necessary to attain those goals. Successful people continually create the positive outcomes that they want in life. Temporary setbacks and disappointments never deter them from continuing to SEE WHAT THEY WANT AND GO AFTER IT. The question is, how do they do this? We all have skills, internal resources and experiences that make us different and special. When we can access them and organize them in a useful way, we find the success we want. 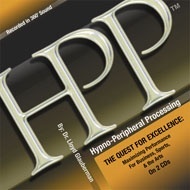 Dr. Lloyd�s Glauberman�s revolutionary HPP method programs your subconscious mind to do just that. Combining both conscious and subconscious processes the Quest for Excellence taps into your best and organizes your thoughts, sensations, feelings and actions so that you spontaneously find yourself in a relaxed energized and focused state when you need to perform. Quest for Excellence will give you the drive to achieve your life goals. Inner obstacles to success will spontaneously disappear - allowing your true potential to break through. If you are looking for a PEAK PERFORMANCE LIFESTYLE, it�s time to let the power of the subconscious get you to the next level. Program yourself for success with Quest for Excellence.